Are you concerned that your child may contract mumps? First, we have to find out what mumps is! Mumps is a viral infection that affects the parotid glands, which are located slightly below and in front of the ears. 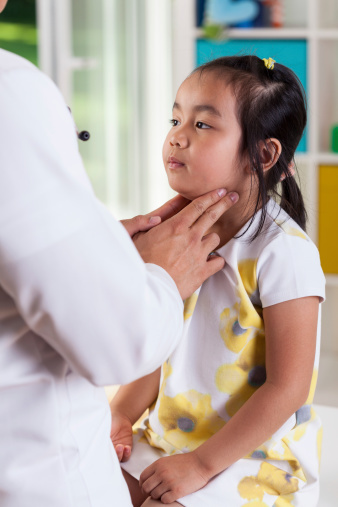 If a child has contracted mumps, these glands can swell causing discomfort. Although rare, mumps can potentially cause hearing loss, meningitis, encephalitis and orchitis (in males). Mumps was common in the United States until a mumps vaccination became available. After the vaccination, health officials saw the number of cases drop significantly. A high fever (up to 103 degrees Fahrenheit) and swelling of the salivary glands follow over the next few days. The glands may not all swell initially. More commonly, they swell and become painful. The mumps virus is most contagious to another person from the time you come into contact with the virus to when your parotid glands swell. There isn’t a course of treatment for mumps, so applying warm or cold packs to the swollen glands that are tender can be helpful. Additionally, health professionals encourage children between the ages of 12 through 15 months of age to receive their first measles, mumps and rubella (MMR) vaccination and their second dose at 4 through 6 years of age. If you are interested in making an appointment with a pediatrician at Flushing Hospital Medical Center, you can schedule an appointment at our Ambulatory Care Center at 718-670-5486. The end of summer is approaching and parents and kids are preparing to go back to school. In addition to new clothes, backpacks and books, all school-age children, from preschoolers to college students, need vaccines. August is National Immunization Awareness Month and today’s vaccines are among the most successful and cost-effective public health tools for preventing disease and death. In 2014, he United States experienced a record number of measles cases with 668 cases from 27 states reported to CDC’s National Center for Immunization and Respiratory Diseases (NCIRD). This is the greatest number of cases since measles was eliminated in the U.S. in 2000. Despite these recent outbreaks, many parents are still unclear which vaccines their children should receive or if their children should receive any at all? Keep a record of what vaccines your child has received and when. 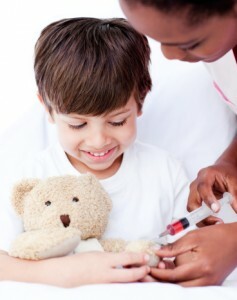 Check with your physician to make sure your child’s immunization schedule is current. By vaccinating your child today, you are not only ensuring their protection against a wide variety of illness, but you are also helping to eradicate these diseases for future generations.